Today we have a guest post from Marie of Just Plain Living. Marie blogs about homesteading and sustainable living. These subjects are often a natural progression for personal finance enthusiasts, as frugal living allows you to spend less money, save more aggressively, and find personal joy and satisfaction outside of consumerism. 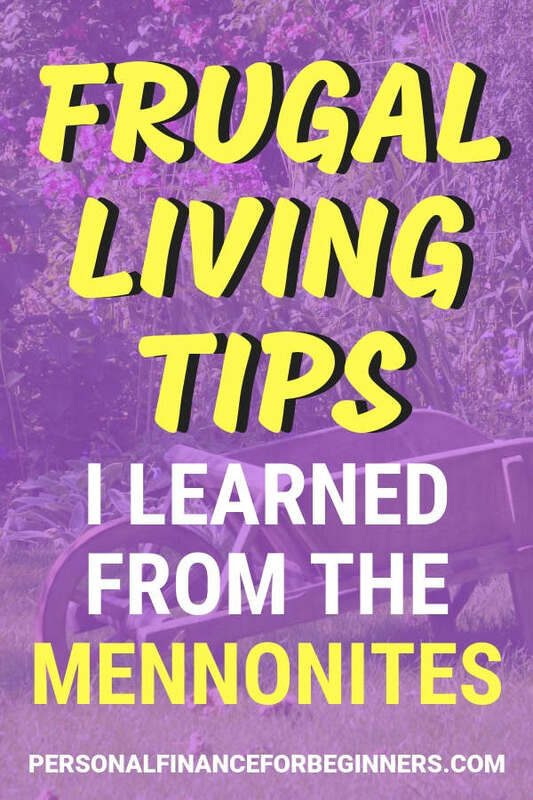 Here’s Marie with some insights on how living near the Mennonites (a self-reliant Christian sect) taught her to think differently about frugal living and how she spends her money. 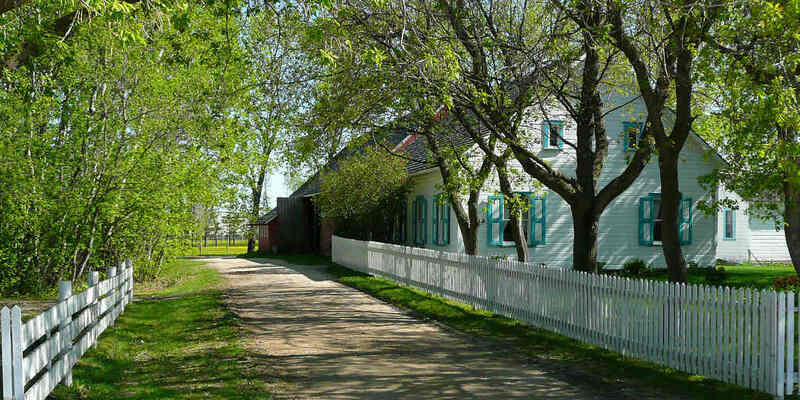 Six years living near and worshipping with Old Order Mennonites taught me a lot. How to put my hair in a perfectly round, neat bun. The proper way to pass a horse and buggy on a narrow road. How to tell someone’s congregation from the strings on their bonnet. Don’t laugh too hard – every bit of it has proven useful even after we moved away from that community. My husband and I started our homesteading journey in the city while living in a dark basement apartment, moved deep into the woods to live in an off-grid cabin for three years, and now we’re living, along with our four young children, in a lovely little village. We no longer live the Plain life, but we have been forever affected by our time with them. More than lessons on hair buns and horses, though, I learned important life lessons about living a minimalist, frugal life. These simple farmers, often with six to twelve children, know a great deal about getting the best value out of every dollar they work hard to bring home. While farmers tend to be rich in land and real property, the truth is that they earn a very meager income to support those large families. And yet Mennonites have a very well-deserved reputation for financial stability. Although many people think about minimalism or simple living in terms of giving things up, we’ve learned that we gain a lot from simplifying our lives. In fact, because of the lessons I learned from them, we got out of poverty, bought our own house, and are now living well. That doesn’t mean we earn a lot of money. It means we’ve learned to live well on less through simplicity. It’s one thing, though, to say that simple living can save you money, but what does that look like in practice? One thing that surprised me at first was how much money the Mennonites were willing to spend on certain things. When a Mennonite homemaker buys a pressure canner, for example, she doesn’t hum and haw and wonder if she should get the less expensive one. She buys the best quality regardless of the price. How does that save money, though? Lower quality goods tend to have a much shorter lifespan than high-quality goods. When the goods in question are expected to only last a short time, that’s fine. Don’t spend a lot of money on anything that’s disposable or only meant to last a season. When it comes to things like everyday footwear, work boots, vehicles, or household appliances, being cheap turns into a false economy. With shorter lifespans, these inexpensive items must be replaced more often. They also tend to be less comfortable or easy to use. A Presto pressure cooker, for example, is a third of the price of an All-American, but it’s less durable and has parts that can break, wear out, or get lost. Instead of deciding to buy the less expensive machine and “deal with the parts when it’s a problem,” thrifty Mennonite homemakers buy the more durable machine that doesn’t need replacement parts. My friend, with eight children, has a very expensive and fully automated washing machine that cost $2200 USD. It’ll last her a lifetime and saves a lot of time. Buying quality sustainable goods for anything you will use for a long time saves time, reduces stress, and saves money. To put it very simply, if you need something for only a short time and expect to dispose of it, buy the least expensive option that will get the job done. But if you are going to be using something for a long time, buy the best quality that you can afford. Do you REALLY need that new phone? A bigger television? The ride-on lawnmower? One lesson I learned from the Mennonites was to assess every purchase. Not only do they look at whether or not they really need an item, but they also look at how it will affect their lives and relationships. Even though the Mennonites I know have telephones, none of them have cell phones. They made a decision, always as a congregation, that cell phones would negatively affect family and community relationships. It doesn’t mean that cell phones are bad, but that they collectively looked at them and decided that the impact would be more negative than positive. In our home, we had a similar discussion about television. My husband and I decided that it was better for our family to forego cable. Take a look around your house. If you’re like most people, you can fill a garage (or have you already filled it?) with things that you really didn’t need, but you bought it on impulse and took six months to pay it off on the credit card. I’m not judging. We’ve done it, too. But if you take the time to really stop and consider the long-term impact of your purchases, you can decide if they really are a need or just a passing desire. When you have six, eight, ten, or more people living in one house, keeping it clutter-free and clean is essential. A few years ago, I was telling my Old Order Mennonite friend that I needed to buy a new coffee thermos for EJ and I was sighing over the price of them. She said, “Oh, we have one that we don’t use!” It took her literally two minutes to find it in her large pantry – something that was stored and unused! How many of us can do that – put our fingers on every item in our home without a great deal of thought? It seems difficult, but that’s because we tend to fill up our homes and lives with stuff we don’t need. The more items we have filling up space, the easier it is to lose track of it all. Instead of having an organized home that is pleasant and useful, we accumulate piles of useless objects. Worse, when we do need something, we can’t find it – and go buy a replacement! Sparse environments also prevent every lost item from becoming a treasure hunt. If you put your car keys, wallet, or phone down in the wrong place, do you sigh and wonder how long it will take? Minimize the places where they can vanish! Related to the idea of having only as much as you can reasonably store without making piles of clutter, you should always know what is in your home. If the idea of taking a household inventory horrifies you, then it’s likely you have far too much stuff. Take the time to get to know what is in your home and make sure they’re all things that you need. You shouldn’t be surprised by a croquet set when you expected to find your golf clubs. Are you still holding onto the plastic ring from the blender that broke four years ago? Get rid of it! If you have items in your home that would be useful to someone else but not to you, then donate them. There’s a lot of truth to the old saying that one man’s trash is another’s treasure. There is nothing really secret or amazing about the financial security that we see in the Old Order Mennonites. In the end, it really comes down to a few simple things. First and foremost, they know what they value. Since strong families and communities are important to them, they assess everything they do by its impact on the family and community. They teach their children how to work hard from a young age, and encourage each person to make a positive contribution to the community. Even without the power of that community behind you, though, it is possible to learn from them. Buy quality sustainable goods when appropriate. Only buy what you actually need, and take your values and goals into account. Keep your space clean. And finally, know what you have so that you can find it easily and don’t spend money replacing what you already have. Your column sent me seeking the origin of using hum in place of hem, and I enjoyed it immensely. Good reminders here. Thank you.